TCK Mixed Martial Arts' kids classes are designed to impart valuable life skills to our students from self-defense and stranger danger to confidence and goal-setting. The primary focus of our kids program is to develop fundamental techniques, and create a solid foundation to build upon as they grow. If you want to boost your child's confidence, help them with self-discipline, and teach them how to respect others as well as themselves, our kids programs are perfect for you. Learn Effective Self-Defense & Build Confidence With Kids Martial Arts In The Bronx! Introducing the Internationally Acclaimed Bull Sharks Program! As you can see we take martial arts training to a whole new level! We use early elements of traditional martial arts curriculums to build skills that are appropriate for 3 and 4 year olds. This means that your child will learn and grow at a pace that is not too easy, nor too challenging. The best part is that the Bull Sharks Program will equip your child with skills that they will utilize in every area of their life! Introducing the Internationally Acclaimed Mako Sharks Program! Five and six year olds are the most enthusiastic students. They love creativity and problem solving, which makes them ideal students in the martial arts. The problem we discovered is they are so progressive in following tasks, some teachers tend to treat them like their older peers. This is a problem because they still do not have the basic skills necessary to keep up with children ages 7 and up. The solution we found is to provide them with their own program that targets their stage of development in a manner that adapts to their social and intellectual curiosity while at the same time building skills that set them up for success. With that said, a structured program introducing basic skill-based training in martial arts has proven to be very successful. As you can see we take martial arts training to a whole new level! We use basic elements of traditional martial arts curriculums to build skills that are appropriate for 5 and 6 year olds. This means that your child will learn and grow at a pace that is not too easy, nor too challenging. The best part is that the Mako Sharks Program will equip your child with skills that they will utilize in every area of their life! Introducing the Internationally Acclaimed Hammerhead Sharks Program! Seven to nine year olds are what most people consider "the golden age." They are proficient in their vocabulary and problem-solving skills, yet they are not at the age where they want complete independence from adults. This makes the teacher-student relationship stronger than ever. The problem we discovered is they still lack core skills, and although they are highly intelligent, they struggle to keep up with students ages 10 and up. The solution we found is to provide them with their own program that targets their stage of development in a manner that adapts to their adventurous attitude and youthful nature while at the same time building skills that set them up for success. With that said, a structured program introducing core skill-based training in martial arts has proven to be very successful. As you can see we take martial arts training to a whole new level! We use core elements of traditional martial arts curriculums to build skills that are appropriate for 7 to 9 year olds. This means that your child will learn and grow at a pace that is not too easy, nor too challenging. The best part is that the Hammerhead Sharks Program will equip your child with skills that they will utilize in every area of their life! Introducing the Internationally Acclaimed Tiger Sharks Program! Ten to fourteen year olds are the smartest students in the school. Yes, they are smarter than most adults! They are also physically competent and can excel in most physical challenges that are presented to them. The problem we discovered is they are so focused on what is socially acceptable that they have a hard time keeping themselves emotionally driven to the task at hand. The solution we found is to provide them with their own program that targets their stage of development in a manner that nurtures their social and emotional instability while at the same time building skills that set them up for success. With that said, a structured program introducing extreme skill-based training in martial arts has proven to be very successful. As you can see we take martial arts training to a whole new level! We use extreme elements of traditional martial arts curriculums to build skills that are appropriate for 10 to 14 year olds. This means that your child will learn and grow at a pace that is not too easy, nor too challenging. The best part is that the Tiger Sharks Program will equip your child with skills that they will utilize in every area of their life! Give Your Child A Kick Start On A Successful Life With Our Kids Martial Arts Classes In The Bronx! Signing up is easy! 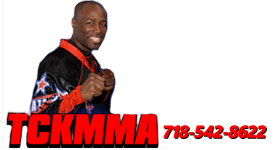 Just fill out the short form on this page and receive all the information you need to sign your child up today for TCK Mixed Martial Arts' amazing kids classes.